Israeli forces have continued with systematic attacks against Palestinian civilians and their property in the occupied Palestinian territories (oPt) for the reporting period of 07 - 14 January 2015. During the reporting period, Israeli forces wounded 3 Palestinian civilians, including 2 children, in the West Bank. In the Gaza Strip, Israeli navy forces continued to target Palestinian fishermen in the Gaza Strip sea. In the West Bank, on 10 January 2015, Palestinian child and youngster from Burin village, south of Nablus, were wounded when a number of children and youngsters went to al-Sabe' Mount, east of Burin village, south of Nablus, to play with snow, but settlers protected by Israeli soldiers attacked them. On the abovementioned day, a Palestinian child from al-Raihya village, south of Hebron, sustained a bullet wound as a settler fired at him. The child went with his brothers and relatives to check on their olive trees, north of the village, when the settler fired at them. In the Gaza Strip, in the context of targeting Palestinian fishermen in the Gaza Strip sea, on 11 January 2015, Israeli gunboats opened fire at Palestinian fishing boats sailing within 1.5 nautical miles off al-Waha resort, northwest of Beit Lahia in the northern Gaza Strip. As a result, a fishing boat sustained damage, but no casualties were reported. During the reporting period, Israeli forces conducted at least 50 military incursions into Palestinian communities in the West Bank. During these incursions, Israeli forces arrested at least 82 Palestinians, including 18 children and 2 women. Twenty-six of these Palestinians, including 11 children and 2 women, were arrested in Jerusalem. On 10 January 2015, Israeli settlers chopped the branches of 40 olive trees and 4 30-year-old almond trees with saws, southeast of Yatta. Around the same time, a number of settlers form “Sousia” settlement” uprooted and chopped 150 olive trees, southeast of Yatta. Furthermore, settlers from “Sidi Buiz” settlement planted lands in al-Khader village, south of Bethlehem, with olive and oak trees and expanded the water network in them. On 11 January 2015, the residents of Yasouf village were informed that the settlers of “Tafuh” settlement attacked the lands of al-Teen al-Shami area. It turned out that the settlers chopped 38 olive trees with an electric saw. During the reporting period, Israeli soldiers used excessive force against peaceful demonstrations organized by Palestinian civilians, international and Israeli human rights defenders in protest at the construction of the annexation wall and settlement activities in the West Bank. As a result, a number of demonstrators suffered tear gas inhalation and others sustained bruises as they were beaten up. · Following the Friday prayer, on 09 January 2015, despite the cold weather, dozens of Palestinian civilians and international and Israeli human rights defenders organized a peaceful demonstration in Bil’in, west of Ramallah, in protest at the construction of the annexation wall and settlement activities. The demonstrators took the streets raising the Palestinian flags and headed to the liberated territories near the annexation wall. Early in the morning, Israeli forces closed all entrances to the city to prevent Palestinian civilians and international and Israeli human rights defenders from participating in the protests. Protestors marched by the annexation wall and tried to cross the fence. Israeli soldiers stationed behind the wall, in the western area, and a large number of soldiers deployed along it, fired live bullets, tear gas canisters, rubber-coated steel bullets, sound bombs and wastewater at them and chased them into the olive fields. As a result, As a result, a number of demonstrators suffered tear gas inhalation and others sustained bruises as they were beaten up. · Around the same time and despite the cold weather, dozens of Palestinian civilians organised a peaceful demonstration in the centre of Ni’lin village, west of Ramallah, in protest at the construction of the annexation wall and settlement activities. The demonstrators took the streets and headed to the annexation wall. Israeli forces closed the gates of the wall with barbwires and prevented the demonstrators from crossing to the land behind it before they responded by throwing stones. Israeli soldiers fired live ammunition, rubber-coated metal bullets, sound bombs and tear gas canisters at the civilians, and chased them into the village. As a result, a number of demonstrators suffered tear gas inhalation and others sustained bruises as they were beaten up. · Also following the Friday prayer, Palestinian civilians and international solidarity activists organized a protest in the center of Kufor Qaddoum village, northeast of Qalqilya, heading to the eastern entrance of the village in protest against closing that entrance since the beginning of al-Aqsa Intifada with an iron gate. The demonstrators threw stones at Israeli soldiers, who fired sound bombs and tear gas canisters in response. · Hebron: Israeli forces have continued to impose severe restrictions on the movement of Palestinian civilians. At approximately 14:00 on Wednesday, 07 January 2015, Israeli forces established a checkpoint at the entrance of Deir Samet village, southwest of Doura, south of Hebron. The checkpoint was removed and no arrests were reported. At approximately 08:00 on Monday, 12 January 2015, Israeli forces established a checkpoint at the entrance of Sa’ir village, east of the city. Around the same time, Israeli forces established a checkpoint at the entrance of Ezzna village, west of the city. The checkpoints were removed and no arrests were reported. At approximately 07:00 on Tuesday, 13 January 2015, Israeli forces established a checkpoint at the entrance of al-Koum village, west of Doura, southwest of the Hebron. The checkpoint was removed and no arrests were reported. At approximately 07:00 on Wednesday, 14 January 2015, Israeli forces established a checkpoint at the entrance of al-Arroub refugee camp, north of the city. The checkpoint was removed and no arrests were reported. · Ramallah: Israeli forces have continued to impose severe restrictions on the movement of Palestinian civilians. At approximately 16:30 on Sunday, 11 January 2015, Israeli forces established a checkpoint near the intersection of Beit Ore al-Foqa, southwest of Ramallah. At approximately 22:30, they established a similar checkpoint under Ain Yabroud Bridge. All checkpoints were removed and no arrests were reported. At approximately 09:30 on Monday, 12 January 2015, Israeli forces reestablished their existence at ‘Attarh checkpoint on the northern entrance of Bir Zeit, north of the city. At approximately 11:00, they established a checkpoint at the entrance of Nilin village, west of the city. The checkpoints were removed and no arrests were reported. · Jericho: Israeli forces have continued to impose severe restrictions on the movement of Palestinian civilians. At approximately 10:30 on Sunday, 11 January 2015, Israeli forces established a checkpoint at the entrance Fasail village, north of the city. The checkpoint was removed and no arrests were reported. · Qalqilya: Israeli forces have continued to impose severe restrictions on the movement of Palestinian civilians. At approximately 18:15 on Thursday, 08 January 2015, Israeli forces established a checkpoint between Izbat Jaloud and Ras ‘Attyya villages, east of the city. The checkpoint was removed and no arrests were reported. At approximately 11:30 on Friday, 09 January 2015, Israeli forces established a checkpoint at the eastern entrance of the city. At approximately, Israeli forces established a checkpoint at the northern entrance of ‘Azzoun village. The checkpoints were removed and no arrests were reported. At approximately 20:50 on Saturday, 10 January 2015, Israeli forces established a checkpoint at the entrance of Jeet village. At approximately 11:454, another checkpoint was established on the road between Izbat Jaloud and Ras ‘Atyya villages. At approximately 16:30, another checkpoint was established between Jius and Azzoun. All checkpoints were removed and no arrests were reported. At approximately 12:30 on Sunday, 11 January 2015, Israeli forces established a checkpoint at the eastern entrance of the city. At approximately 18:00, a similar checkpoint was established at the entrance of Seer village while another checkpoint was established under Jius Bridge on the road between Qalqilia and Tulkarm at approximately 18:15. At approximately 19:30, a similar checkpoint was established at the entrance of Azzoun village. At approximately 19:50, a similar checkpoint was established at the entrance of Izbat al-Tabib village, east of the city. All checkpoints were removed and no arrests were reported. At approximately 16:00 on Monday, 12 January 2015, Israeli forces established a checkpoint between Izbat al-Tabib and Asala villages. They detained Muhammad Khaled Tabib (17) and Thaer Byan Tabib, an officer at the General Intelligence, then released them. At approximately 17:10, another checkpoint was established t the entrance of Azzoun village. · Tulkarm: Israeli forces have continued to impose severe restrictions on the movement of Palestinian civilians. At approximately 09:00 on Thursday, 08 January 2015, Israeli forces stationed ‘Annab military checkpoint which is established on the road between Tulkarm and Nablus, east of the city, tightened their restriction against civilians and obstructed their movement. Later that day, the tightening ended and no arrests were reported. The tightening renewed on Friday, Saturday, Sunday, Monday and Tuesday. · Jenin: Israeli forces have continued to impose severe restrictions on the movement of Palestinian civilians. At approximately 22:30 on Friday, 09 January 2015, Israeli forces established a checkpoint on the road between Jenin and Tulkarm and Nablus, near the intersection of Arraba village. The checkpoint was removed and no arrests were reported. At approximately 09:30 on Saturday, 10 January 2015, Israeli forces stationed at the “Mofodatan” checkpoint which is established on the bypass between Jenin and the northern towns of Tulkarm. Later the tightening ended and no arrests were reported. · Salfit: At approximately 19:00, on Monday, 12 January 2015, Israeli forces established a checkpoint between Hares and Kuful Hares villages, north of the city. The checkpoint was removed and no arrests were reported. · At approximately 09:00 on Wednesday, 14 January 2015, Israeli forces arrested Muhammad Abdel Jawwad Ekhlil (22) from Beit Amer village, north of Hebron, after he was stopped at “Gosh Itsion” settlement, south of Bethlehem. · At approximately 14:00 on Thursday, 08 January 2015, Israeli forces moved into the neighborhoods of the Old City in Jerusalem after they closed al-‘Amoud, al-Sahira, and al-Asbat gates under the pretext of looking for a person who stabbed an Israeli settler in the evening of the aforementioned day. They raided and searched a number of houses and arrested 5 civilians, including two children: Muhammad Naser Miswedeh (21); Muhammad Ali Hijazi (20); Khaled Ahmed al-Qawasmi (24); Muhammad Akram Abu Rmeila (17|); and Wael Samir Kilghassi (17). · At approximately 01:00 on Friday, 09 January 2015, Israeli forces arrested Muhammad Hani Matuq (16) when he was at al-‘Amoud gate in the Old City in Jerusalem. He was taken to an unknown destination. · At approximately 20:00 on the aforementioned day, Israeli forces arrested two Palestinian children after chasing them near al-‘Amoud gate area, east of the Old City in Jerusalem, when they were playing with the snow. According to eyewitnesses, Israeli forces arrested Abdel Rahim Musa Barbar (16); and Hussam Abdullah al-Khatib (17) after chasing dozens of children who were playing with the snow near the Jewish cemetery. Israeli forces claimed that the children were throwing snowballs at Israeli settlers who were in the area. · At approximately 17:00 on Saturday, 10 January 2015, an Israeli settler opened fire at a number of merchants in the Bazaar market in the Old City in Jerusalem after a wrangle and a clash erupted between the settler and the merchants. According to an eyewitness, an Israeli settler in the Bazaar market opened fire at the civilians without wounding anyone. He added that the settler lives in one of the settlements of the Old City. Furthermore, he is known for his constant provocation attempts. The Bazaar merchants explained that Israeli police arrived at the place and arrested Anwar Muna (24) and established checkpoints at the gates of Old Jerusalem. · At approximately 19:00 of the aforementioned day, Israeli forces stormed the African neighborhood near al-Majles gate in the Old City in Jerusalem. 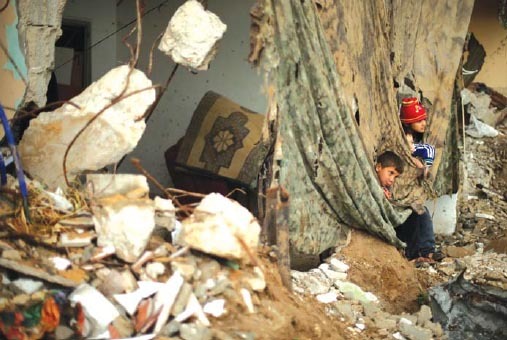 They raided and searched a number of houses and arrested Nasri Bachir al-Firawi (13). · At approximately 20:00, Israeli forces raided the Central neighborhood of Silwan village, south of the Old City in Jerusalem, after a settler’s car caught on fire in the aforementioned area. They deployed in the streets and established a checkpoint on al-Ain Street. They arrested 8 civilians, including two children: Mahmoud Kamal Jaber (20); Muhammad Mustafa Shiwyyat (20); Hamza Anwar Jaber (20); Hamdi Anwar Jaber (14); Khaled Kastiro (20); Fares Abu Nab (19); Khalil al-Rashq (15); and Murad Kasterro (21). · At approximately 06:00 on Monday, 12 January 2014, Israeli forces moved into al-Isawia village, north of Jerusalem. They raided and searched a number of houses and arrested 3 children: Muhammad Yousif Abu al-Hims (13); Qusai Dari (14); and Nadim Zahra (14). · At approximately 12:00, Israeli forces arrested Misbah Abu Sbeih (45) and his son Sbeih (19) when they were attending the trail of Izz al-Din, the son of the aforementioned person. They were taken to al-Maskubyya investigation center. · At approximately 13:30, Israeli forces arrested two Palestinian women near Hatta gate, one of the gates of al-Aqsa mosque, in the Old City of Jerusalem. They were taken to al-Maskubyya investigation center. They were identified as: Sanaa Dweik (34) and ‘Ayda al-Deesi (31). · At approximately 05:00 on Tuesday, 13 January 2014, Israeli forces moved into al-Khilla area in al-Tour neighborhood, east of the Old City in Jerusalem. They raided and searched a number of houses and arrested 2 civilians: Abdullah Muhammad al-Hidra (19) and Ayyoub Yousif Abu al-Hawa (21). · On Saturday, 10 January 2015, Israeli settlers cut off the branches of 40 olive trees and 4 30-year-old almond trees with saws, southeast of Yatta, south of Hebron. The trees belong to Jibreel Abu ‘Arram and Khaled Musa Abu ‘Arram. The land which was attacked is located in ‘kherbat Abu Qwawis, southeast of Yatta, near bypass road (317), between “Mitssibeh Yair” and “Sousia” settlements. · Around the same time, Israeli settlers from ‘Sousia” settlement, southeast of Yatta, uprooted 150 olive trees belonging to Shatat family. The owners of the lands found out about the both attacks after the weather improved. Israeli police investigated the incidents. · At approximately 09:30 on Saturday, Palestinian youths went to al-Saba’ mountain on the eastern sides of Burin village, south of Nablus, to play with the snow. After they reached the area, settlers from “Jifat Runim” backed by Israeli soldiers attacked the children and youths and chased them towards the town. After the village residents heard of the attack they headed to secure the comeback of their children. They threw stones at the settlers and Israeli soldiers immediately opened fire. As a result a child and a young man were wounded. They child (15) sustained a bullet wound to his leg while the young man (18) sustained a bullet wound to his right leg. They were both moved to Rafidia Hospital for treatment. Their wounds were described as moderate. · At approximately 11:00 on the same day, Ibrahim Isa Suleiman Tubasi (14) from al-Reihya village, south of Hebron, sustained a bullet wound to his left thigh. He was shot by a settler form “Beit Hajjai”. The child was wounded when he was with his relatives trying to check out their olive trees after the area had witnesses a polar low. The aforementioned was taken to al-Ahli Hospital in Hebron and went under a surgery. His medical condition was described as stable. · On the aforementioned Saturday, two settlers form “Sidi Buiz” settlement planted lands in al-Khader area, south of Bethlehem, with olive and oak trees and extended the water network. Ahmed Salah, the coordinator of the Settlement and Annexation Wall Committee, said that Hassan Musa was surprised when he entered his land in Ain al-Qissis area, west of the village, to see his land planted with 20-year-old oak trees and dozens of olive trees. Moreover, he found out that the water network in his land was extended. Salah mentioned that the attacked land has an area of 20 acres. He added that such attacks aim to serve as a strategy to facilitate the expansion of “Sidi Boiz” settlement and connecting it with “Navi Danielle” settlement. · At approximately 15:00 on Sunday, 11 January 2014, the residents of Yasouf village, east of Salfit, were informed of an attack carried out by the settlers of “Tfuh” settlement in al-Teen al-Shami lands, north of the aforementioned village. Upon their arrival to the area, they found out that the settlers chop 38 olive trees with an electric saw. The owners of the lands received phone calls from other farmers who went to check their lands after the snow stopped and found out that the trees in plot no. 10 were chopped. It should be noted that the owners of the aforementioned lands are not allowed to enter their properties without security coordination. Moreover, no vehicles are not allowed to enter area because there is no road for vehicles except that which is only used by the military and the settlers. Car traces were found which means that the settlers are involved in the attack. The aforementioned lands belong to: Muhammad Sail Hussein ‘Itani; Mahmoud Mustafa al-Haj Hassan; Saed Salim Yasin; and Shaher Muhammed Deeb.